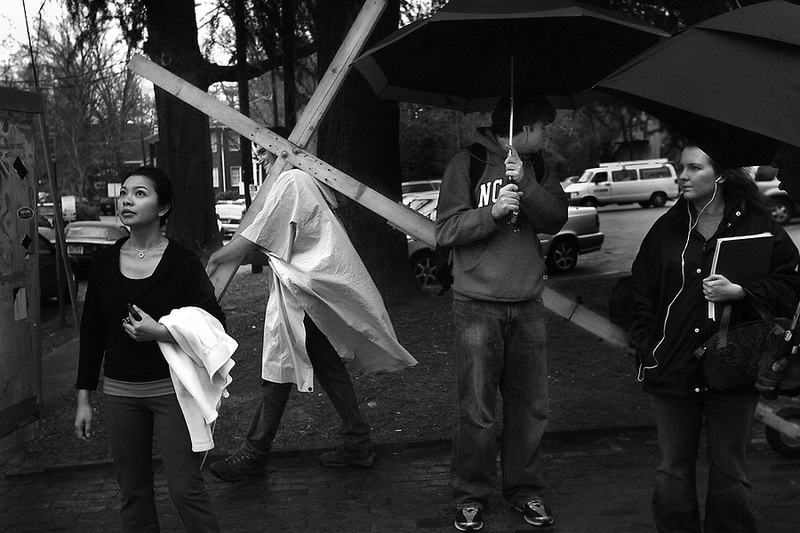 AOF.FE.011108.EDR.JPG About one third of the way through his 1,000-mile walk from Ellicott City, MD, to Miami, FL, David Valderrama (cq), 28 , passes students along Hillsborough St. in Raleigh while pulling his wooden cross on Friday, Jan. 11, 2008. "My goal is to bring salvation to those who are lost," said Valderrama. " I love to stop and talk, but God really wants me to walk. The more people who see me, the more people who might be touched," he said. Valderrama, who starting walking on Sept. 10, 2007, expects his trek to last one year. "I am walking with God alone on this journey, and all I have with me is a few clothes, journals to write in, a little water, a small first-aid kit, and my cross." Valderrama relies on the kindness of strangers he meets along the way, and says he's never been without a place to stay overnight. You can track Valderrama's progress on his website: http://www.bravegeneration.com/ Staff photo by Ted Richardson/News & Observer.